Shrouded in mystery under open blue skies, Moundville Archaeological Park is a spectacular location for a spring or summer day trip. Moundville Park is situated on and around an ancient Native American city-state. The civilization, whose ancient name is unknown to archaeologists, was one of the great cities of the Mississippian Indians. As its name suggests, the city of Moundville Alabama is famous for its more than 20 hill-like mounds. 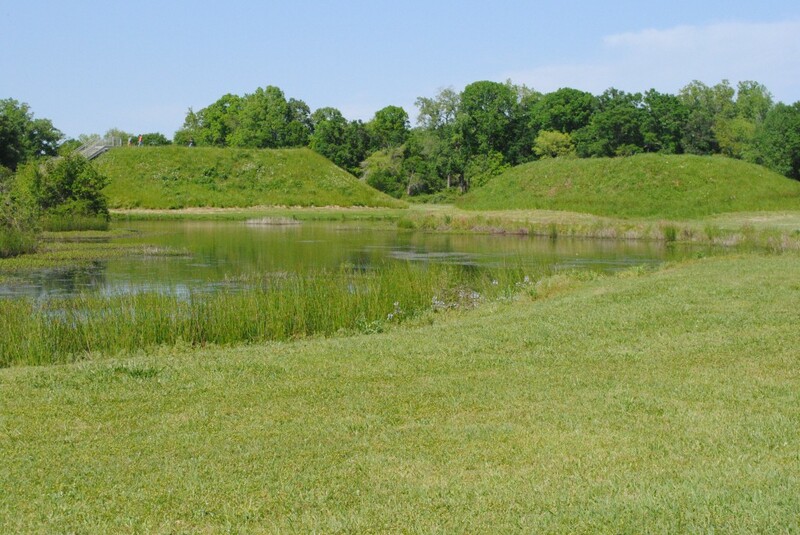 The mounds, ranging in height from a few to more than 60 feet, were all constructed by hand. The two prominent mounds are located in the northeast corner of the park. Known simply as Mound A and Mound B, archaeologists believe the two mounds were the crown jewels of the civilization. The tallest mound on the site, Mound B, was likely the site of royal residence. A replica of the house where the supreme chieftain likely lived exists on top of the mound. Mound A, though much shorter, is longer than many of the mounds. Also notable about Mound A is its unique alignment. It is the only mound that does not have an east-west or north-south alignment. The mounds’ purpose is unknown. However, some theories revolve around their use in religious ceremonies. Archaeologists have discovered that Moundville was a cultural center for the Mississippians. As a part of Franklin Roosevelt’s New Deal, the Civilian Conservation Corps began heavily excavating the site in 1938, uncovering immense amounts of pottery and other signs of an organized and prominent city. Today, Moundville Archaeological Park stands as a monument to the Mississippian culture. The site is preserved by the University of Alabama and is open daily to the public. Just eight dollars for adults and six dollars for students, the all-access ticket to the park includes a 1.6-mile paved path around the perimeter of the mounds that can be either walked or driven, two different walking trails that overlook the Black Warrior River and a visit to the museum. Throughout the Moundville Archaeological Park experience you are constantly learning about the culture of the Mississippians. The setup of the park lets the imagination wonder back to the first half of the second millennium, when Moundville was possibly the epicenter of the entire Southeastern United States. The park holds educational events every Saturday, which are beneficial to scholars of any age. Moundville is located 20 miles south of Tuscaloosa and 75 miles southwest of Birmingham. If driving is not a concern for you, there is no reason you should stay away from Moundville when planning your next weekend road trip.